Baking. Heating. Broiling. 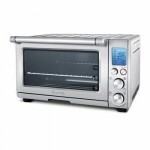 Waring Pro TC0650 Digital Convection Oven Can Do it All! People may buy a toaster oven to complete a variety of kitchen needs. This Waring Pro TCO650 review will explain the many reasons to consider this particular toaster oven. When buying a toaster oven, there are a few features to consider. You should pay attention to the size, accessories, and heating functions of each unit. Here is a closer look at what this Waring Pro model offers. Besides making toast, Waring Pro TC0650 is highly versatile. 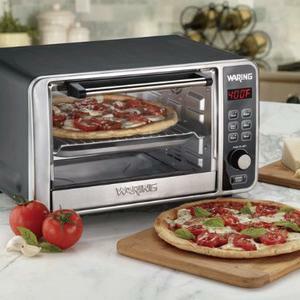 You can use it to heat bagels, bake pizza, or reheat leftovers. 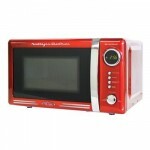 This type of product is commonly preferred over other cooking methods because it does not produce soggy results like a microwave oven. Also, it prevents the need to heat a large oven for a small job. This Waring Pro TCO650 provides 1500 watts of power. It has a large capacity that can hold up to six slices of bread or a 12 inch pizza. Unlike other units that have confusing dials, this toaster oven has a digital 60 minute timer with an LCD display and touch pad controls. This Waring Pro TCO650 oven provides numerous positives. For instance, this unit is a convection oven. This means that there is a built in fan that circulates air better than a normal oven. 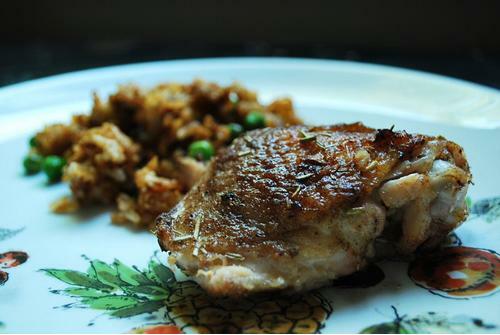 Convection cooking brings many benefits. It will likely shorten cooking by one-third and always results in excellent baked goods. This particular model has five cooking functions; bake, convection bake, broil, toast, and pizza. Another pro is the accessories that are included with the product. You will receive an extra oven rack, baking pan, and crumb tray. The crumb tray will make clean up very simple. Finally, the stainless steel exterior will look good on any kitchen counter. 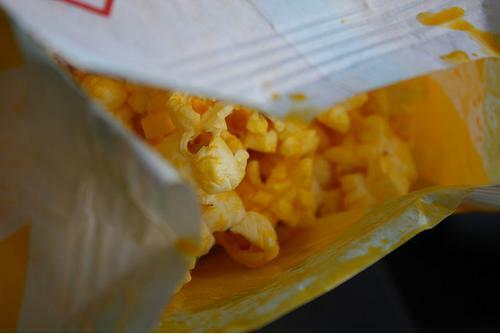 It does not contain the traditional nonstick coating like similar units. This nonstick coating is known to be made of chemicals that can create dangerous fumes during cooking and leak into food to cause health concerns. In the words of the marketing guru, any product designer should always strive to polarize. Failure to do so means nothing but a mediocre products. Let’s see what features may work against the TC0650 when you are making your consideration. Personally, I did not like the loud beep from the unit when the food was ready. The loud alarm can be awkward and offsetting when a person is cooking when company is present. But again, it depends on how you perceive the usefulness of such feature. If you always find yourself multi-tasking – juggling between cooking multiple dishes and kids roaming around – then you would find the noise to be unobstructive or maybe helpful after all. Also, I feel that an auto eject rack would make it easier to remove the food from the oven. Most people were very pleased with the cooking results from this toaster oven. The unit heats quickly and cooks evenly. This means that all food will turn out juicy and cooked to perfection. This oven does a nice job at maintaining temperature throughout the cooking process as well. Cleanup is very easy, so the unit will remain looking great for a long time and will not smell like burning crumbs after each use. Not every toaster oven manages to cook food as well as a real oven. However, the Waring Pro TCO650 always brings great results. 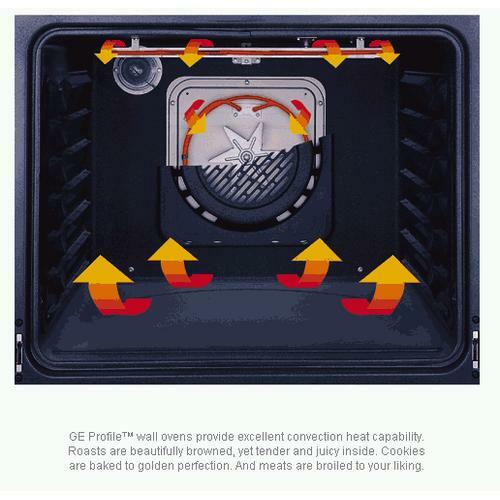 This oven provides convection heat along with four other cooking options. Its large capacity means that it will work well for a large family or party needs. I’ve now laid my assessment on one of Waring’s top-rated toaster oven. It is now your turn to make the call. 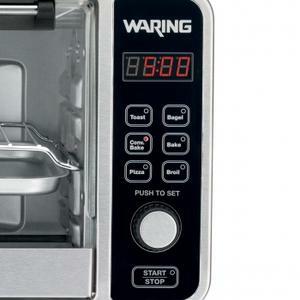 Do you think the Waring Pro TC0650 is what you need for your kitchen? If this oven review has somewhat left you undecided, why not consider Cuisinart TOB-40? While the similar price range between the two is obvious, what’s little known is both Waring and Cuisinart actually belong to the same parent company. 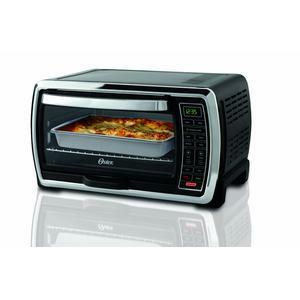 Convection Oven Guides for Dummies Heard of the Oster Digital Large Capacity Toaster Oven (TSSTTVMNDG)? 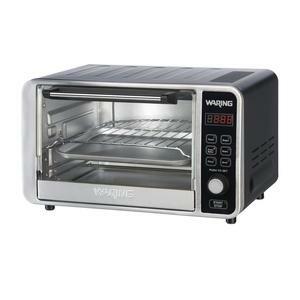 Waring Pro WT0450: Feature-packed Toaster Oven Made for Toast Lovers Cuisinart CMW-200: A Convection + Microwave, Anyone? however I chose this large model to be able to cook with when I have company.I have never had a convection oven so I am so excited about buying this one.I know I will love it!I am now searching recipes to start cooking with convetion,rather then use conventional oven,it’s healthier.Thanks Waring!please keep me updated on your products!! Her Is To The Best! Thank You! !